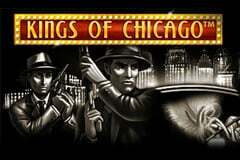 It’s time to rewind time as you find yourself back in the 1930’s in Chicago where you’ve just been invited to take a seat in the back room of a casino for an underground poker game against the toughest gangsters in the city – with 20,000 coins on the table to try and escape out the back door with! In a time when Al Capone ruled the streets of Chicago, you’ll find yourself in a dark room filled with smoke as you listen to the busy atmosphere of the casino, with the chittering of customers and noises of coins being pumped into the video poker machines audible, as you rub shoulders with the city’s most notorious crime bosses who are wearing tailor-made three piece suits as they puff on Cuban cigars and keep their guns close by in case someone tries to make a dodgy move for the cash! The Kings of Chicago slot machine has been developed by Net Entertainment and is played across 5 reels with 5 fixed paylines, however the reels don’t spin in the typical way you’ll be used to - instead you’ll see a deck of cards get spread out across the table from left to right in a 5x3 grid. You can stake from 1p up to £1 per payline and with up to ten coins allowed to be bet per line this means you can take a seat at the underground poker game from as little as 5p up to £50, plus it boasts a hefty 97.8% return to player percentage so your money will last well into the early hours! It’s only poker cards and hands that feature on the table (well along with chips, cash, diamonds, guns, cigars and alcohol of course) therefore you had better know your poker hand rankings or these mobsters will take advantage and hustle you like a fool for the night. They have left the Joker cards in the deck and these are the Wild symbols in the Kings of Chicago slot machine, possessing the ability to substitute for all other cards and hands, even the Scatter symbol (which shows Chicago’s biggest mob boss as the King card), plus when they substitute for a winning combination the win is worth double its face value. Natural royal flushes are of course the highest valued hand with five of them resulting in you scooping 10,000 coins, plus you can make a five of a kind, a royal flush, straight flush, four of a kind, full house, flush, straight and three of a kind. Of course, the majority of the time it’s three Scatter symbols that you will trigger, however the fact that you can re-trigger additional free deals as they play out provides you with better chances of triggering the four or five combinations instead for even greater wins, plus all winning combinations your deals create are subject to a 2x multiplier – if only all mobsters were so generous! I really love how the Kings of Chicago slot machine has been developed by Net Entertainment with the cards spread across the table with the final column being flipped over at the last moment to keep you in suspense, although it is a little disappointing that there is only a free spins/deals feature. Once you master the cards and are crowned a card shark after taking all of the mobster’s cash you should also check out The Sopranos slot machine from Playtech, or for a gorier experience, the Scarface slot machine which has also been developed by Net Entertainment, as they both boast a plethora of exciting bonus features!